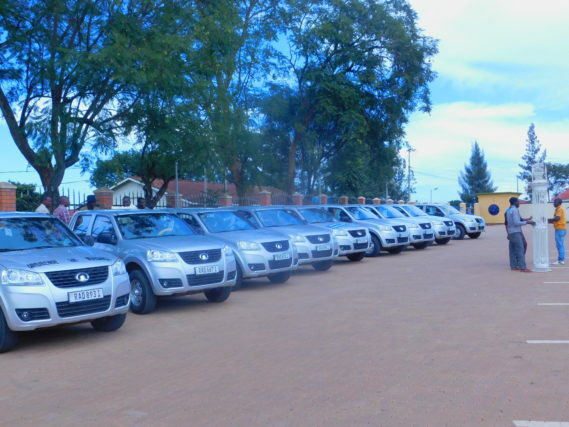 Residents of 10 sectors of Kicukiro district have mobilised funds and purchase 10 cars worth Rwf169m. With a total of almost 350.000 residents and annual budget of Rwf12 billion, they started mobilising the funds early last year. According to Deo Munyaneza, the Public Relations Officer of Kicukiro District, ‘the population would meet in their usual general meetings and request for contributions’ from everyone willing, and raised enough to purchase the cars that “will help in monitoring cleanliness such as looking for unhygienic places and patrolling the neighbourhood to ensure security”. On March 27, 2017, the District unveiled the cars to the residents. Speaking at the event, the Mayor of Kicukiro District, Dr Jeanne Nyirahabimana thanked the residents for their initiative that showed their strength to self-reliance. She said that the cars will help improve security and also make facilitate local leasers to offer better services. “There is a moment when the Executive Secretary of the sector would fail to move and wait for a ride on the Police vehicle which many times comes very late,” says yirahabimana. “We wanted every sector to have a car, but the district could not afford the cars for every sector,” she said. Kigali City Mayor, Pascal Nyamurinda, who presided over the inauguration, acknowledged the role the residents of Kicukiro District. He also urged district authorities to take care of the cars because they belong to the people. The residents said they hope the cars will help in the fight against increased drug abuse in the area. “We will call local area security (Irondo) and we hope this time they will be able to intervene faster than before,” one of the residents said. Meanwhile maintenance of the cars will be funded by the sector. Other parts of the country are also in the process of emulating the same practice.